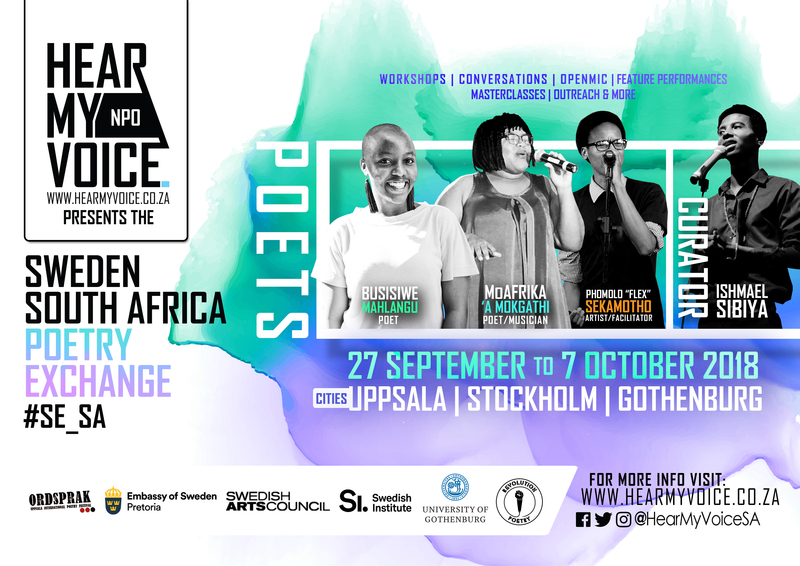 Stolta och glada över att med kort varsel kunna presentera några av Sydafrikas bästa och mest lovande poeter: Koleka Putuma, Ishmael Sibiya, Busisiwe Mahlangu, Muriel “MoAfrika” Mokgathi-Mvubu och Phomolo Sekamotho. Ishmael Sibiya is an arts facilitator and manager focused on the development of emerging artists specifically within the Literature (Poetry and Spoken Word) industry. He has coordinated, produced and facilitated numerous noteworthy poetry projects namely, The Tshwane Speak Out Loud Youth Poetry competition which is one of the most rewarding poetry competitions in South Africa, awarding over R50 000 in cash prizes and international touring opportunities. He also runs international arts exchanges between South Africa and other countries such as the USA and Sweden. He is a co-founder of Hear My Voice, a South African non-profit organization focused on developing young spoken word artists as well as creating open and uncensored platforms for youth to express themselves through spoken word poetry. 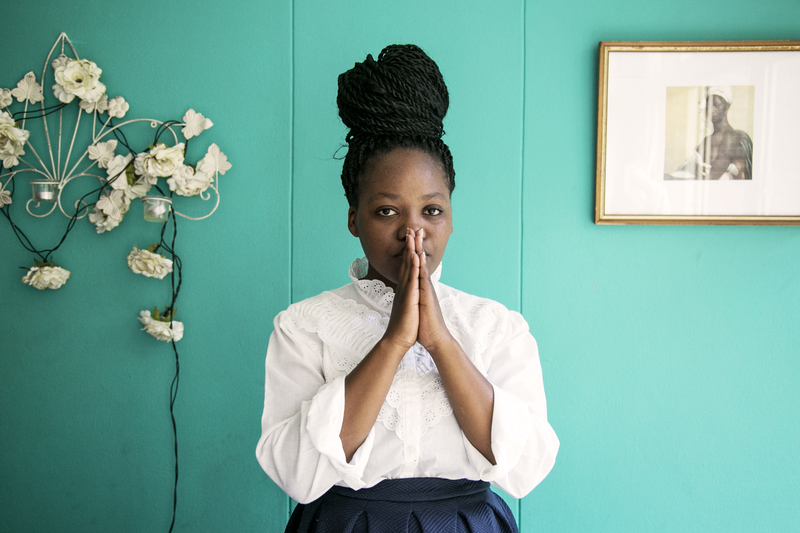 Busisiwe Mahlangu is a multi-award winning poet, TEDxSpeaker and founder of Lwazilubanzi, a community project aimed at making learning fun and accessible in public schools. Her work converses and interrogates issues around poverty, domestic violence, mental health and survival. She is longlisted for the Sol Plaatje European Union Poetry Award 2. She has performed on stages around South Africa including: The Naked Word Festival (2017), Open Book Festival (2017), Vavasati International Women’s Festival (2016), Words In My Mouth Slam Week, Lead SA Changemakers and TEDxPretoria. In poetry slam competitions, she has attained these titles: winner of the Tshwane Speak Out Loud Youth Poetry Competition (2016/2017), winner of Another Kinda Slam by Mzansi Poetry Academy (2017) and winner of the National Library of South Africa’s Library Week Poetry Slam (2017). Her poetry is published on Sol Plaatje European Union Poetry Anthology volume 7, Ja Magazine, Naane Le Moya, Kalahari Review and ‘Poems, stories and letters for the rainbow nation’ a reading pack for grade 4-9 learners in the Gauteng province. Her work is forthcoming in the Atlanta Review and Best New African Poets 2017 anthology and she is offered a writing residency on Naane Le Moya for the month of April. She is currently studying for a BA in Creative Writing majoring in Linguistics and African Languages at the University of South Africa. Muriel Mokgathi-Mvubu known as MoAfrika ‘a Mokgathi is a South African based multi-faceted artist, who is a performer, Poet, cultural activist, Art-‘preneur, Band leader, award winning radio presenter-Producer and a civic leader amongst many in her talent hat. MoAfrika is known for her Sepedi pen, her fusion of the language with English, fusing with Jazz, soul and kiba rhythms blending with her deep sassy vocals that keep her followers wanting more. MoAfrika started her artistic journey in 1999 professionally in 2005. In the 13 years she has headlined an impressive list within the Music and literary spaces. MoAfrika co-founders art organizations and seats on boards as an executive adding her brick to building a solid industry in South Africa from foundation to professional level which is a rare encounter. MoAfrika is currently working simultaneously on her poetry and jazz debut album “From Mamelodi to Mali’ and a book “My tongue is a rainbow” both to be released when the rain comes. Born in a township called Thabong in South Africa, Phomolo Sekamotho, better known as Flex (of He & I) has since been trying to explore and create avenues for poetry within a larger body of music. He & I is a ‘poetry in music’, afro-trip band that create the melodies to supplement the spoken word. The sound is testament to their passion and love for the Mother Continent. His craft has seen him travel and share all across Southern Africa, Washington DC as well as New York. 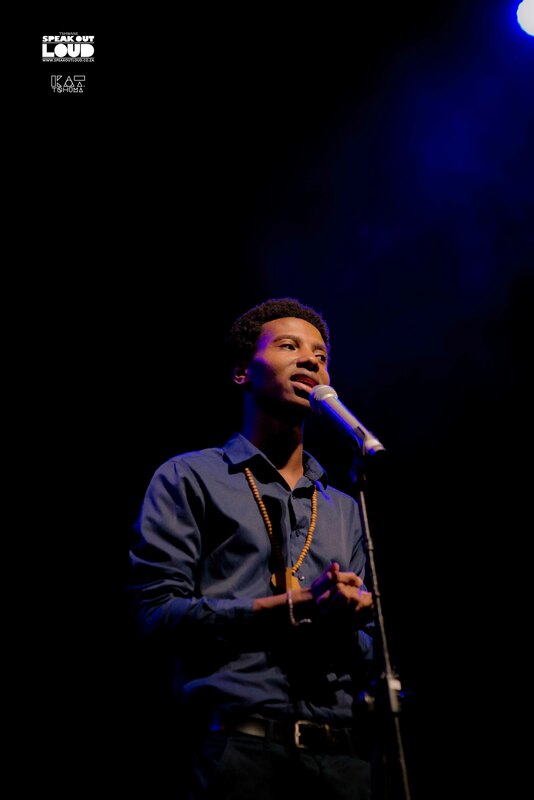 In 2012 he headlined the House of Hunger Poetry Slam in Zimbabwe. In 2015 he toured the United States of America, performing and facilitating writing workshops in schools across Washington DC. Flex is currently working on a live “poetry in music” album with his 6 piece band. Under the Fly Language and Azania to DC banner, He has facilitated workshops at the Pioneer Academy in Johannesburg as well as Washington DC under the Azania to DC banner, creating channels that serve as a platform for communities of young artists to express and exhibit their creativity, talents, beliefs, history, culture and perspectives.